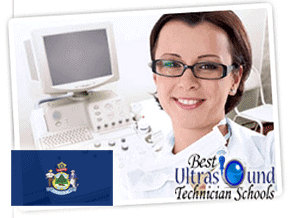 In Maine, there is only one school that offers an ultrasound technical program: Kennebec Valley Community College (KVCC). Located in Fairfield, a town of around 7,000 people in Somerset County, Kennebec Valley Community College is a two-year community college counted among the seven institutions that comprise the Maine Community College System. Kennebec Valley offers a certificate-level training program in sonography, which is accredited by the Commission of Accreditation of Allied Health Education Programs (CAAHEP). The school offers the program through its Allied Health Department. The curriculum of the sonography training program at Kennebec Valley is designed for completion in 16 months (1 1/4 years). The program pre-requisites include a two-year Associate or Bachelor of Allied Health degree in nursing, radiologic technology, respiratory therapy, medical laboratory technology, or physical therapy assistance. Other pre-requisites include documentation of patient care experience or CNA course, an information session with the KVCC program director, and owning a current Basic Life Support Certification (either CPR certification for the Health Provider from the American Heart Association or Professional Rescuer certification from the American Red Cross). The criteria for completion of the training program consists of completion of 54 credits, attaining a minimum grade of "C" in all the courses, and getting a final GPA of at least 2.0. Subject areas covered in the curriculum include abdominal sonography, obstetrical and gynecological (OB/GYN) ultrasound, and diagnostic medical sonographic interpretation. Also included are four practicums--primary, intermediate, integrated, and advanced--which are supposed to gradually ease students in a practical manner into the profession of sonography. The U.S. Bureau of Labor Statistics (BLS) reports that diagnostic medical sonographers in Maine had a median annual income of $69,700 ($33.50/hour) in 2012. That year, according to the BLS, the bottom 10 percent of sonographers in the state took home $53,100 ($25.52/hour), while the top 10 percent earned $89,600 ($43.08/hour). These numbers are higher than the national numbers. The BLS has the number of diagnostic medical sonographers in Maine at 260 in 2010; it expects a 50 percent increase between then and 2020, thus bringing the number of workers up to 390.